(Phys.org) —Racetrack Playa is home to an enduring Death Valley mystery. Littered across the surface of this dry lake, also called a "playa," are hundreds of rocks – some weighing as much as 320 kilograms (700 pounds) – that seem to have been dragged across the ground, leaving synchronized trails that can stretch for hundreds of meters. What powerful force could be moving them? Researchers have investigated this question since the 1940s, but no one has seen the process in action – until now. Because the stones can sit for a decade or more without moving, the researchers did not originally expect to see motion in person. Instead, they decided to monitor the rocks remotely by installing a high-resolution weather station capable of measuring gusts to one-second intervals and fitting 15 rocks with custom-built, motion-activated GPS units. (The National Park Service would not let them use native rocks, so they brought in similar rocks from an outside source.) The experiment was set up in winter 2011 with permission of the Park Service. Then – in what Ralph Lorenz of the Applied Physics Laboratory at the Johns Hopkins University, one of the paper's authors, suspected would be "the most boring experiment ever" – they waited for something to happen. "Science sometimes has an element of luck," Richard Norris said. "We expected to wait five or ten years without anything moving, but only two years into the project, we just happened to be there at the right time to see it happen in person." Their observations show that moving the rocks requires a rare combination of events. First, the playa fills with water, which must be deep enough to form floating ice during cold winter nights but shallow enough to expose the rocks. As nighttime temperatures plummet, the pond freezes to form thin sheets of "windowpane" ice, which must be thin enough to move freely but thick enough to maintain strength. 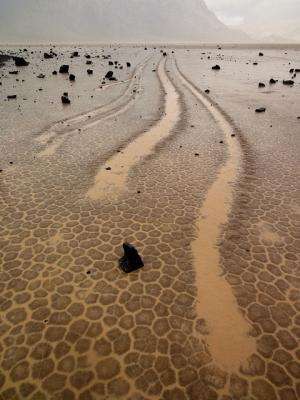 On sunny days, the ice begins to melt and break up into large floating panels, which light winds drive across the playa, pushing rocks in front of them and leaving trails in the soft mud below the surface. "On Dec. 21, 2013, ice breakup happened just around noon, with popping and cracking sounds coming from all over the frozen pond surface," said Richard Norris. "I said to Jim, 'This is it!'" Individual rocks remained in motion for anywhere from a few seconds to 16 minutes. In one event, the researchers observed rocks three football fields apart began moving simultaneously and traveled over 60 meters (200 feet) before stopping. Rocks often moved multiple times before reaching their final resting place. The researchers also observed rock-less trails formed by grounding ice panels – features that the Park Service had previously suspected were the result of tourists stealing rocks. "The last suspected movement was in 2006, and so rocks may move only about one millionth of the time," said Lorenz. "There is also evidence that the frequency of rock movement, which seems to require cold nights to form ice, may have declined since the 1970s due to climate change." Richard and Jim Norris, and co-author Jib Ray of Interwoof started studying the Racetrack's moving rocks to solve the "public mystery" and set up the "Slithering Stones Research Initiative" to engage a wide circle of friends in the effort. They needed the help of volunteers who repeatedly visited the remote dry lake, quarried the rocks that were fitted with GPS, and maintained custom-made instruments. Lorenz and Brian Jackson of the Department of Physics at Boise State University started working on the phenomenon for their own reasons: They wanted to study dust devils and other desert weather features that might have analogs to processes happening on other planets. "What is striking about prior research on the Racetrack is that almost everybody was doing the work not to gain fame or fortune, but because it is such a neat problem," said Jim Norris. 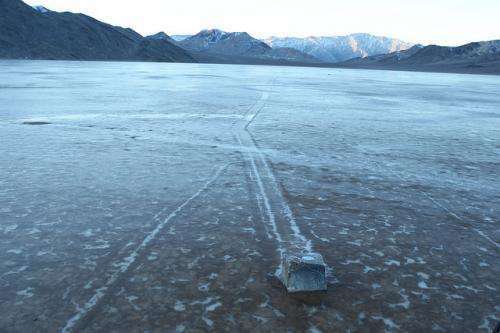 "We documented five movement events in the two and a half months the pond existed and some involved hundreds of rocks", says Richard Norris, "So we have seen that even in Death Valley, famous for its heat, floating ice is a powerful force in rock motion. But we have not seen the really big boys move out there….Does that work the same way?" How the Egyptians built the Pyramids? Lots and lots of people and water. They had to bring their own rocks?! The Park Service needs to get a grip! How self important (and how risk averse) can they be? Now that it's solved they may allow some of the 'original' rocks to be tagged. Certainly one of those research projects where you never know whether you'll get the data within your career or not. I can understand that they are happy about the early results. Among other things, again, an inaccurate if not untruthful headline. Since the large boulders that also move were not observed, it cannot be so definitively stated that the situation has been "solved". And, among other things, mud can be very sticky. Light wind cannot be expected to leave such thick tracks as are shown in the pictures. And if the rocks are riding on ice, it's questionable how it formed beneath them and how they manage to scrape the mud to produce the tracks. In fact, there is no sign in the film of tracks being left by the stone that is claimed to have moved. It is also all but beyond credulity to think that no one thought to set up a camera before and check the film afterward. Like the famous 'pitch drip' experiments, no-one expected anything to happen while watched. Now, perhaps, the team will be allowed a few more instruments ?? The researchers also observed rock-less trails formed by grounding ice panels - features that the Park Service had previously suspected were the result of tourists stealing rocks. No officer, that's not a 320kg rock in my pocket, I'm just pleased to see you. You gotta admire them for that little climate change addition. First it was no more Polar bears, then no more snow and now no more sailing rocks. Damn you humans, damn you all to hell. The comment by Nkalanaga is probable the secret to why the Americans are not doing well in the America's Cup races. They have their sails upright!! I sure hope that in the next races the Americans realize their mistake and have their sails parallel to the water surface. And being parallel to the surface the sail area can be infinitely large = more speed. And no-one made the comment that when the smaller rocks are exposed to sub-zero conditions they also "freeze" and therefore some ice forms under the rocks. This will slightly raise the rocks and act as a lubricant for wind forces to move them or for broken ice sheets to impact on them and move them. The larger rocks might require really cold conditions due to heat retention in the rocks. Ice under the large rocks will also move with appropriate "lubrication"
It is simple perseverance and observance that solve most mystery.....Congrats on the clearing up of another myth and making science count....well done. Who's going to browse through tens of thousands of hours of film to see if the rocks move? That would be a hell of a lot of film to waste, considering it took these guys three years to get any movement, and the initial assumption was that it's probably not going to happen even that often and even then it's probably going to be very poor weather. It's only in the last 10 years or so that we've had digital cameras with enough resolution to even see rocks moving anyhow while photographing a large chunk of a valley from miles away. Certainly one of those research projects where you never know whether you'll get the data within your career or not. That would explain why the AGW Cult has fabricated global warming data. All the fish, reptiles, birds and animals that have been tagged taught scientists a great deal, so the hypervigilance over rocks really makes one wonder. The park service does many good things, e.g. education, search and rescue, etc., so I'm guessing in this instance the only two things to guard are the rocks and the mud. Also the rocks have their own microbiomes if you think about it. Considering the whole of human behavior currently, protecting the rocks is rather commendable. Awesome to have solved another riddle with science. That though occurred to me too. However, unless there has been a shift in weather temperatures since ancient times, it never gets cold enough for ice to form. Using Ice might help explain monoliths like stonehenge though it seems to me. I still believe in the Intelligent Design theory that suggests there is an omnipotent, invisible, bearded cosmic fellow who moves these rocks.